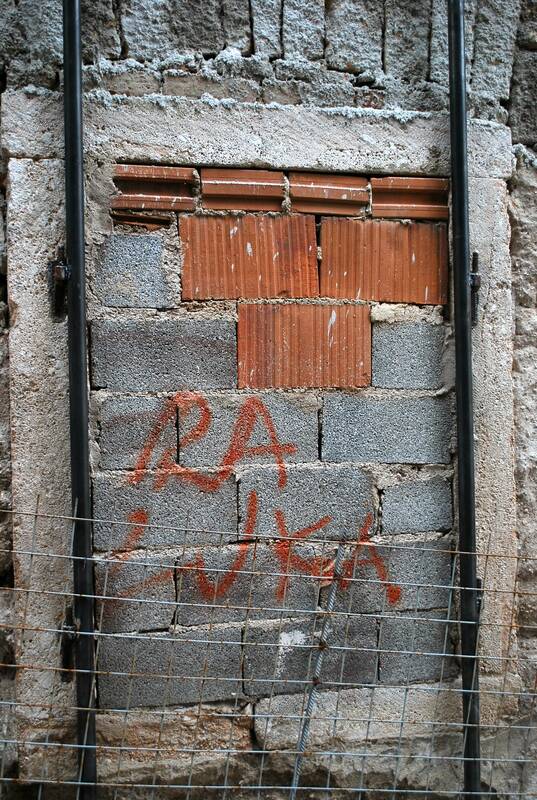 Just when I think that I have discovered all I can about Mostar, I find another place that defines this city. Curious about the bombed out Orthodox Church, I took a walk into the hills above the old city. 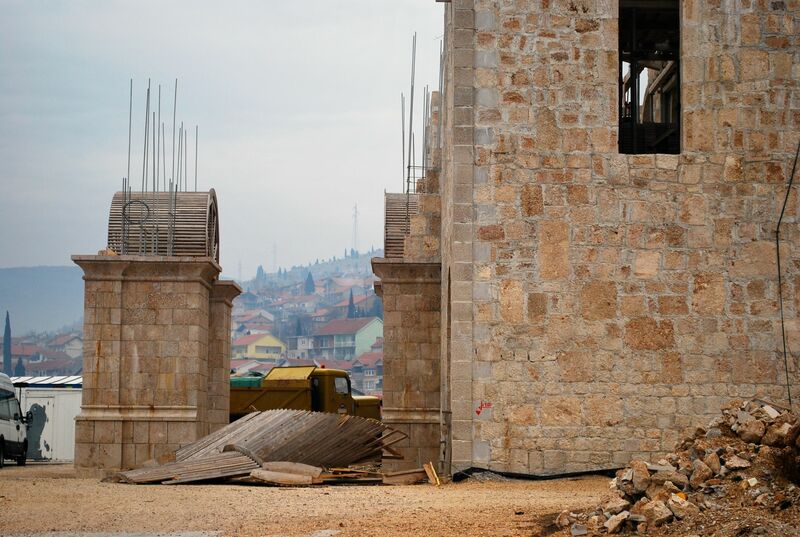 Above the Serbian consulate, a part of the Bishop’s palace, was a road that split under a new bridge. I could see a hostel being built to the right and to the left, a construction area. No noise in the construction area. I walked up a narrow street and then up a long stairway next to this construction zone. There was a gate, but it was open with the padlock chained to it. On the left side was a wall, broken in places and beyond, the shell of the Orthodox Church. The edifice was on two parts, but neither seemed to be finished. It seemed abandoned, but there there were signs, trucks, and a crane. The church was the spine of the structure, made of stone. Above my apartment, in the hills, there are a number of new houses, many unfinished, made of red clay cinderblocks, or grey concrete block. The rawest of them were inhabited; the more complete have a coat of plaster. These houses are replacements. The eastern side seems slowly erasing the bullet holes and fragments of the war. Yet, below my house is a huge bombed out building in the slow process of being rehabilitated. The fine wooden doors have finally been destroyed. Further down the street is another building with beautiful wrought detail work, but it languishes covered with scaffolding and netting. Other buildings nearby are carefully propped up with scaffolding, cinderblocks to enclose windows, and signs to keep out the passerby. A short walk from the Orthodox Church is the Clock tower, a wonderful structure that peeks out of the hill. It, like the Bishop’s palace, has a marker noting its historical value. But it is a ruin. 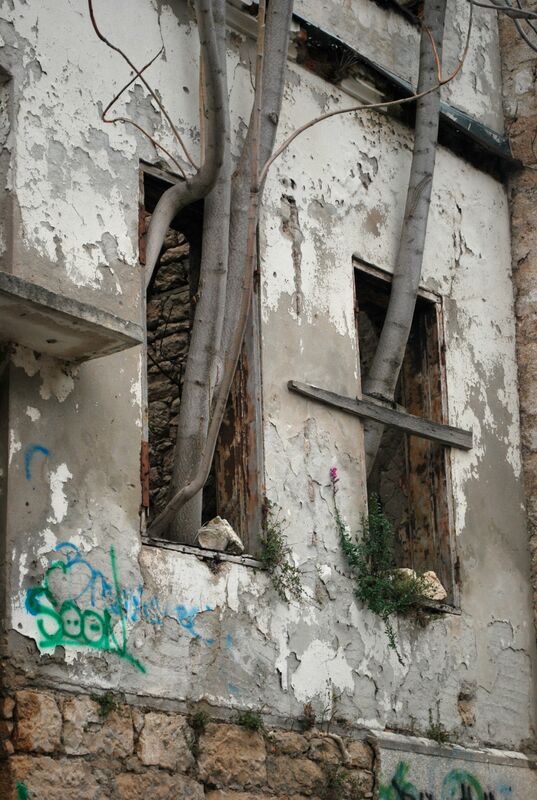 The building next to the tower has trees growing out of windows, and a doorway or archway full of garbage. The Clock itself no longer works. It is frozen in time. Next to a cemetery, it is both invisible and visible. The worn steps leading up the hills above the old town are steep. These ruins, half finished projects, and the bones of the beautiful look more despairing in the rain. The Old Bridge has been rebuilt, and is flooded with tourists in the summer, spring and fall. Even in the winter, the rare tourist can be seen pausing over the river. The old town area has been rebuilt, with attention to historical detail. Unless you take the time to view the historical photographs and video in the bookstore at the foot of the bridge, you would never know this street had been a street of rubble. 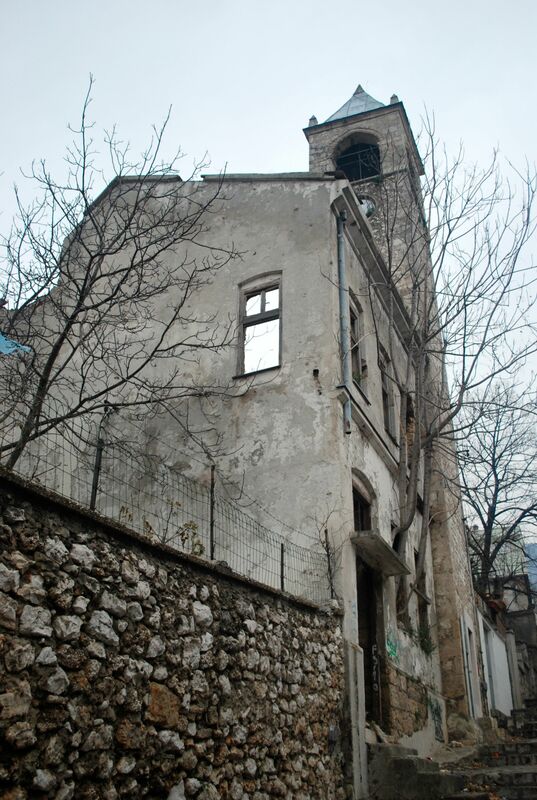 In Mostar, it seems as if the ruins outnumber the repairs. With an imagination, one can visualize how Mostar once looked, and how it could look. It could match the descriptions found in tourist literature of a beautiful southern city. The many pocket parks, the beautiful partisan Monument, and the Marshall Tito street with its mix of Austrian Hungarian buildings, soviet style stores, and narrow alleys interesting the residential area to the northeast. The bus station and train station, too, are crumbled. 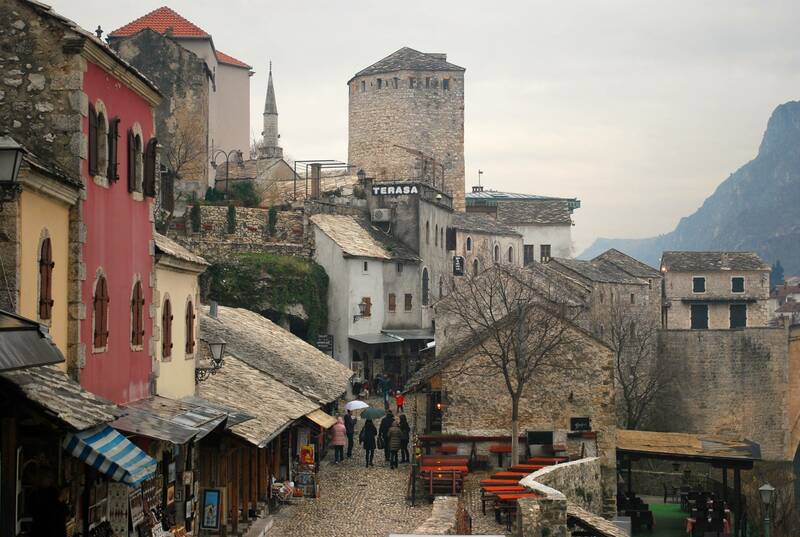 With rehabilitation, with new surface on the streets, completed sidewalk and open cafes, with the graffiti erased, the arrival to Mostar could be amazing. While there is historical meaning in retaining a few of the ruins, or marking the damage with signs or a trail of markers, so many ruins and unfinished projects make a statement of despair. The Catholic Cathedral is complete, but with a desolate deteriorating fountain with a statue of Mary. The Synagogue remains a cornerstone. The unfinished raw ruin of the Orthodox Church makes an unflattering note next to the cross on the Dom Hill, and the complete monument to the fall of the war near the Rondo. It often seems that as one sees a beautiful building, it is a neighbor to the derelict. The University of Mostar sits across from the Partisan Monument (cemetery), an overgrown mess of weeds and broken glass. The “other” university sits next to ruined army barracks, and a lovely new post office. This is a forgotten city. It is a city for architects. For landscape architects. There are so many memories here. So many versions of the country’s history. And its memories. This entry was posted in Uncategorized and tagged architecture, clock tower, mostar, Orthodox Church. Bookmark the permalink.